How does Fog Bank work?? 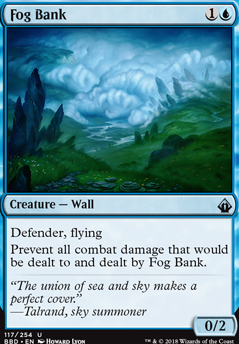 Does Fog Bank stop trample damage? or Axebane Guardian for that matter. 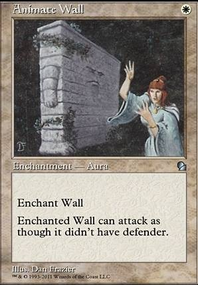 Overgrown Battlement is great, but it really never hurts to have repeats and guardian makes mana of any color. Karplusan Minotaur is an absolute monster. Dont think I like Fog Bank , why are you stalling? Is this deck that slow? 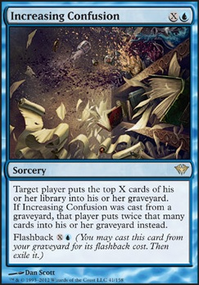 After seeing the whole deck, i like fogbank even less. It feels like a filler card Venser, Shaper Savant is a better call, Whirlpool Warrior I like better, it just feels like it doesnt help the greater goal ya know. Goblin Artisans , surely there are better coin flip triggers out there. Hello, have you considered lowering the average CMC of your deck? There are some new Defenders that are really good and are only 1-drops: Portcullis Vine is like another Wall of Mulch and both provide card advantage (I like to use them to get cards out of Kelp tokens) and Resolute Watchdog is a Defender that can protect Arcades from destruction for only . 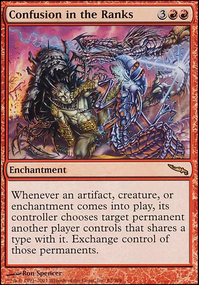 Also I personally use flicker spells to protect the general and get some cards out of it: Eerie Interlude and Ghostway (the latter is expensive so it sits for now in my Maybeboard). And I've a question - why don't you use Sunscape Familiar ? It looks like easier to cast Augustin and nets a card from Arcades. The same thing goes for Gamazoas and Fog Bank - I guess you use them as blockers and/or small flying defenders? Overall I really like the combos you listed here and I'll try to make room for them in my build, have a look if you want Impenetrable Shield. My main goal here is to ramp ASAP to get Arcades in T3 and start protecting him or spamming defenders to get as many cards as possible (why I haven't thought of Lab-man is beyond me xD). Jpinkman, if I try 4x Fog Bank instead of 2x Fog Bank and 2x Azorius Arrester ? I would use 4x Negate instead of 2x of them and 2x Hindering Light , what do you suggest? Gomazoa , Fog Bank are some defenders to consider. Fog bank stops loots of modern fatties and gomazoa is basically removal in a mill deck.